According to research by Aberdeen Group, smart organizations push for all aspects of talent acquisition to be efficient and effective, from online reference checking to on-boarding. Organizations that conduct online reference checks struggle less to find the critical skills versus businesses that don’t use reference checking. 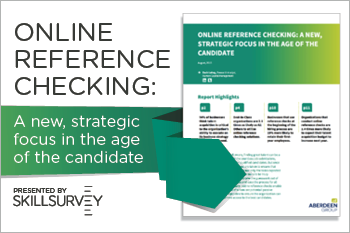 Download: Online Reference Checking: A New, Strategic Focus in the Age of the Candidate.